Many homes today simply don’t have the space to accommodate a full size swimming pool. A swim spa is the perfect solution! In fact, less space is only the beginning. Here’s why a swim spa may be better than a traditional pool. The Benefit of an Adjustable Water Current – With a current to swim against, a swim spa gives everyone, at every skill level, the chance to swim laps without ever hitting the wall. Adjustable current makes it easy to slow the water down for the kids, and speed it back up again for more advanced swimmers. Year Round Use and Enjoyment – When is the last time you used an in ground pool in a snowstorm? The unique benefit of all season use makes a swim spa an exciting investment. Perfectly sized to fit indoors or out, it goes anywhere you might like to have access to swimming from home. Low Maintenance and Operating Costs – Unlike a traditional swimming pool that demands time and money, the average swim spa is easy to care for. With less water to heat and fewer chemicals needed, the swim spa offers savings on both accounts—maintenance and operating costs. To learn more about the benefits of owning a swim spa, pick up a copy of our free buyer’s guide, Secrets to Swim Spa Buying Success. 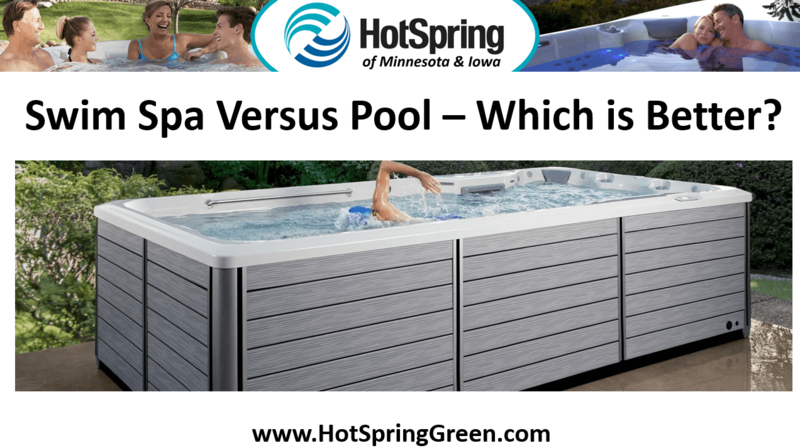 Just give us a call at ☎ 515-270-8702 or visit our website at: https://hotspringgreen.com/swim-spas.